These are all the spoons we've used to get Liam to eat. 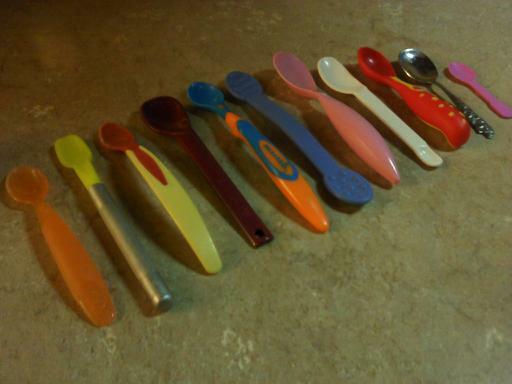 Regular spoons...therapy spoons. And all of the poor things have wounds from the battle. This blog has journaled the fallout of giving birth to a micropreemie & how it's affected everything in our life from marriage & family, to friends & church & beyond. Liam's early arrival gave him a list of diagnoses like CP, CVI, & ROP. His most impacting special needs are his mixed tone ataxic/athetoid-like cerebral palsy & vision issues. He's non-verbal but teaches us all. Follow along as we try to live this crazy normal, knowing God is the author and he isn't finished writing this story. All content copyright Jennifer McIntosh. Design by Sarah Anne Design. Powered by Blogger.